This past Christmas, my son-in-law's family came to visit from southern France. They joined us for Christmas dinner and the happy chaos of our gift exchange with my cousin, all the daughters, sons-in-laws and eight grandchildren! They enjoyed the day, and very graciously gifted me with some special presents! One of these gifts was the basis for today's tablescape, and I'm thrilled to share it with you: a bright and colorful tablecloth that truly represents the vision of Provence. I "oooed and ahhed" when I opened the package. Here's the table I created, and I hope you you can see why I was so pleasantly surprised when I saw their thoughtful and lovely gift! Of course the star of the "show" was my gifted tablecloth. Note the bright yellow and deep blue of the design palette as well as the pattern of wheat shafts and black olives sprinkled across the cloth. I started my dish stack with a woven placemat I found at Bed, Bath and Beyond. Then I added my yellow Metaceramica plate from HomeGoods. I completed the stack with a blue glass sherbet dish. My idea for food for the meal on the table would start with a fresh fruit salad (I think I was envisioning a brunch for this table). I completed my place setting with amber-colored glasses from Dollar Tree. Inside the glasses, I placed my yellow and blue napkins from Old World Market. I used my borrowed flatware from my cousin. I chose this goldtone flatware to contribute to the warm feeling I wanted addressed for this tablescape. My centerpiece is very special to me. My oldest granddaughter (she's 11 now, turning 12 in August! ), was visiting. She was working with Kinetic Sand (this is a GREAT project if you have children or grandchildren visiting: absolutely NO mess; it can be molded like PlayDough, but clean-up is a breeze, and it doesn't dry out!). She created this flower display and as soon as I saw it, I knew it would be a perfect centerpiece for my Provence table. Thanks, Allie, for your creativity and help with my tablescape! I flanked this piece with candlesticks from HomeGoods. I love their "chunkiness" and Chinoiserie-inspired pattern. For accent pieces, I used my blue and white porcelain teapot (one from my collection) and one of my favorite finds at HomeGoods: Chinoiserie-inspired porcelain birds. I thoroughly enjoyed producing this table today. Many thanks to my guests for their thoughtfulness and kindness in gifting me with such a lovely tablecloth. I look forward to using this table for a country-inspired brunch! Some day I would love to visit Provence in person and revel in the bright patterns and colors of their fabrics!! Au revoir!! Christine at www.rustic-refined.com for Dishing It! and Digging It! on Monday. Please take some time to visit these blogs and enjoy all the creativity that is shared. What a gorgeous tablecloth, Rosie! Blue and yellow combination is so cheery, too. Adore that rooster plate! 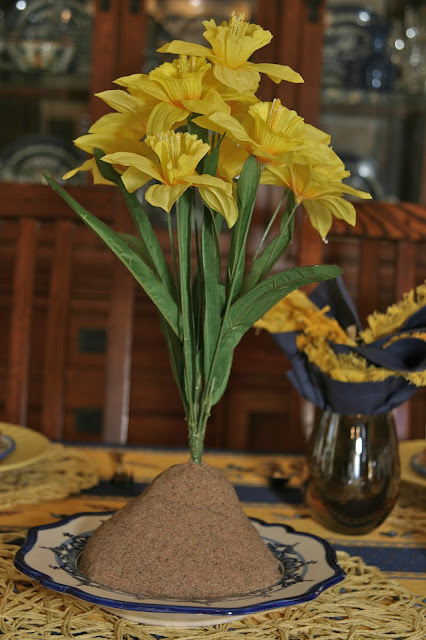 What a cute centerpiece...I will have to check out kinetic sand, never heard of it. I love the tablecloth, and you used it as the basis for a cheerful, bright tablesetting. The little birds are darling, too. How amazing that you had the perfect dinnerware for this beautiful cloth. You captured spring beautifully on your table! I love this table Rosie! My two favorite colors of blue and yellow combined with a french feel. The tablecloth is beautiful. Amazing as always! I LOVE blue and yellow together and this table is one of my favorites! Everything from the tablecloth to the plates and napkins is just perfect. Great idea with the napkins. They make quite a statement yet simple to do. Oh lucky you Rosie, and the cloth is gorgeous! I think the F&F plates are definitely the right choice for your table in Provence! I haven't heard of kinetic sand, but it sounds like something my grands would love! How fun to have your granddaughter's help, it's perfect! It's prettier than when you explained it to me!!!!!! Such a beautiful gift Rosie, and a lovely table! What a beautiful tablescape, story and overall presentation. I feel like Beauty & the Beast would be honored to dine at this beautiful table. Très beau!